As regular visitors will know, I am often visited by the estimable Doctor James Dillingham of Edinburgh, who takes a leisurely tea in the drawing room whilst regaling me with tales of a medical nature. 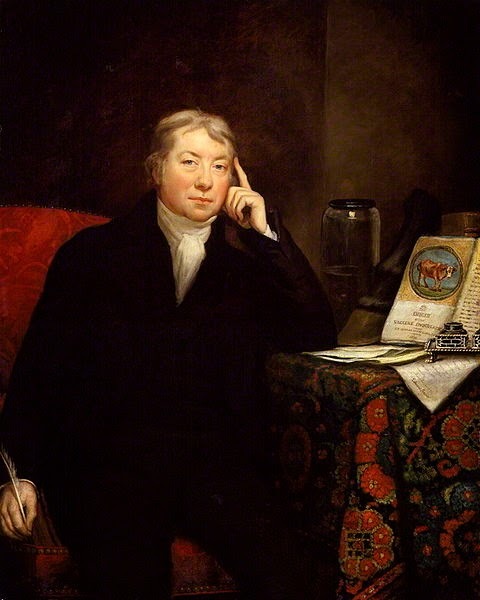 Since today marks an important anniversary in medical history it is time to take a trip back to Gloucestershire in 1796 where we find a medical gentleman by the name of Edward Jenner hard at work on his research. As a boy growing up in Berkeley, Jenner had long been aware of a country tale telling that milkmaids who had been infected with cowpox never fell prey to the virulent disease of smallpox that killed so many in the Georgian era. Cowpox was a skin irritation that was far from fatal and Jenner found himself contemplating how this might be used to protect against smallpox, an infection that proved so deadly amongst children. 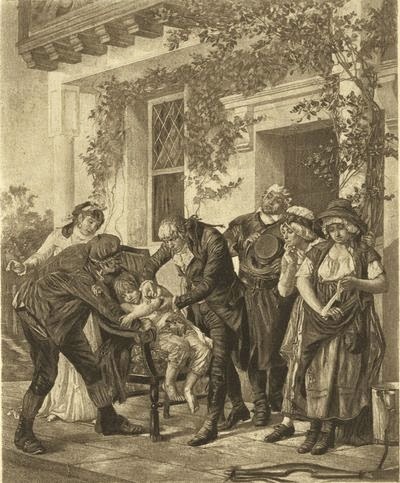 Vaccinations using cowpox-infected material had been carried out in small numbers in Europe already but the experiments, research and findings had not been collected until Jenner set to work. Inspiration struck in spring 1796 when milkmaid Sarah Nelmes came to visit the doctor with a rash on her hand, fearing that it might be the dreaded smallpox. Instead, Jenner diagnosed Nelmes with cowpox and asked if he might take a sample of the pus from one of her blisters. She readily agreed and the scraping was taken. Now there was only the matter of finding someone willing to test the theory and for this he enlisted eight year old James Phipps, the son of his gardener. On 14th May 1796 the material taken from Nelmes was introduced into Phipps by way of small cuts on the boy's arms. 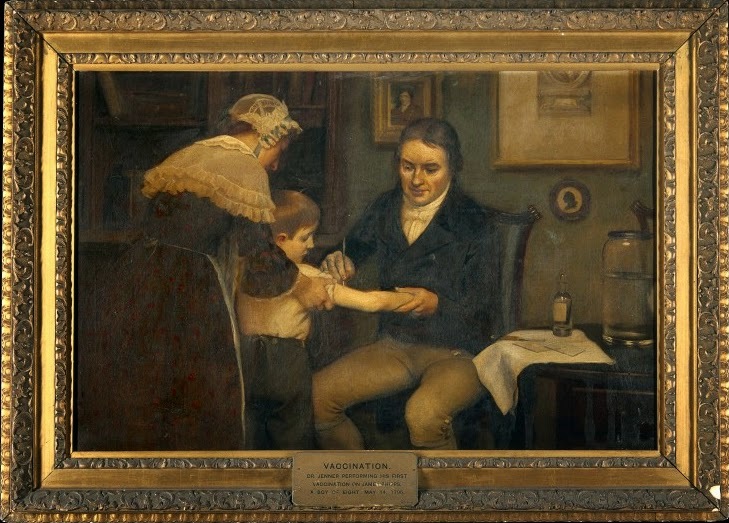 Once he had exhibited and recovered from the symptoms of cowpox, Jenner variolated the boy, rubbing smallpox-infected material into the same small cuts. No doubt this was a very stressful time for the child and all who cared for him and as the hours ticked by they watched anxiously for any signs of infection. In fact, aside from a few light symptoms of fever, Phipps survived both this vaccination and many subsequent similar experiments. Jenner's theory had been proved and he set to work documenting and publishing his research. Jenner encountered plenty of opposition to his new method, particularly from those who questioned the morality of using bovine material in humans and the doctors who made a living from variolation and had no interest in vaccination. He was not to be deterred though and became the spokesman for the cowpox method, with the vaccination method first tried on James Phipps eventually becoming the standard treatment to guard against smallpox. Jenner enjoyed plaudits and decoration for his work and in turn he awarded the adult Phipps and his family with a cottage in recognition of the part he had played in this most important series of experiments. Thanks for posting. In my novel set in 1860 Pacifi NW, there is an outbreak of smallpox that kills many of the local Coast Salish people and the young son of the MC. In fact, in 1864, such an outbreak killed 60% of the Haida, T'simshian, Tlingit. I read a lot of vacination practice here my area at my time and came to the conclusion that small pox was definitely deadly and the patient suffered greatly. A few years ago, I had the chance to talk to the Infectious decease at the University of Washington Medical School. Small pox is supposed to be gone but back in the 1960s he was working in London when a patient, a recent arrival from Pakistan came to the hospital. No one identified small pox until too late. He was called in to assist. The patient died, infected some members of the staff and killed them. Some in the community were affected too. He said it was a pretty awful disease to get. Thank you for your comment. It certainly was a dreadful disease and I was shocked to read of the outbreak in London that you were informed of. I know the disease is officially eradicated now but it must have been terrifying to live in a time when it was so widespread. Bravo Dr Jenner! He was always my hero. But now I must also take the long suffering James Phipps into the pantheon, too. Thank you, as always, Catherine. Your choices are fascinating. And to think that smallpox now no longer exists, I think. I'm sure it was down to a very few cases somewhere in Africa, and that was years ago. There are still a few vials of the smallpox germ or virus, whichever it is, protected by high security, and I've read--but not for some time--some worries that terrorists could somehow pilfer some of the vials and loose them on an unprotected public, but I haven't read anything about it recently. I'm old enough so that for my first trips abroad I always had to be vaccinated, and my two adopted daughters had to be vaccinated before they entered the US (one was born in Thailand, one in Chile) in the 70s and neither of them are thrilled by the fact that they bear the vaccination scars, whereas none of their US-born contemporaries do, but I am unsympathetic. Just like a mother . . .